UPDATE – See write up of this on the Child Protection Resource blog here. What does the Family Court do? … This is your chance to find out. Join His Honour Judge Stephen Wildblood QC, designated family judge for the Bristol area, and a panel of legal experts to hear about how the Family Court works, what to expect and where to get helpful information. 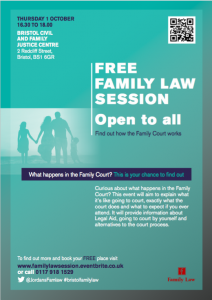 Find out what the Family Court does, what it’s like going to Court and what to expect in terms of: paper work, giving evidence and the hearing process in general. Get information about Legal Aid, the support available when you attend Court by yourself and alternatives to the Court process. What are Private Law Orders and upon what basis are they decided? What happens after a case? Numbers are limited so book as soon as possible to avoid disappointment (booking via Eventbrite). *Please note that individual cases will not be discussed.